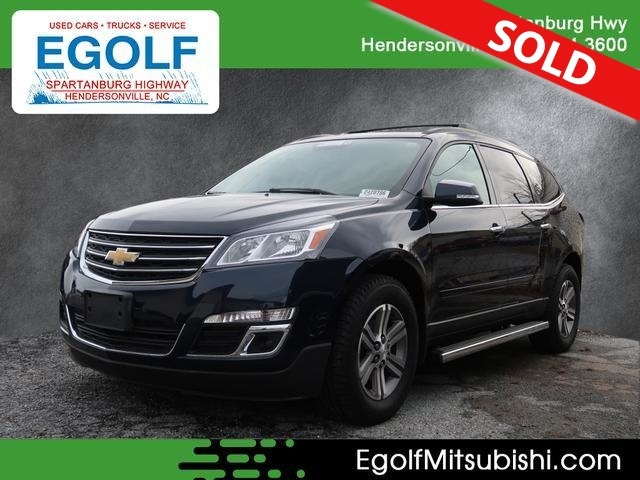 2016 CHEVROLET TRAVERSE LT AWD, AUTOMATIC TRANSMISSION, HEATED LEATHER SEATING, MEMORY SEATING, NAVIGATION THIRD ROW SEATING, ALLOY WHEELS, DUAL POWER SUNROOF, REMOTE KEYLESS ENTRY WITH REMOTE START, POWER REAR LIFT GATE, SIDE STEPS, AND MUCH MORE. PLEASE CONTACT EGOLF MITSUBISHI SALES AND SERVICE @ 828-694-3600 FOR MORE INFORMATION AND TO SCHEDULE YOUR TEST DRIVE TODAY @ 1325 SPARTANBURG HIGHWAY, HENDERSONVILLE NC 28792. FINANCING AVAILABLE FOR ALL CREDIT TYPES!!. Do you need a big SUV that can shuttle lots of people and cargo? The 2016 Chevrolet Traverse is made for you. Besides its utilitarian abilities, it's also pleasant to drive and will make the most of your money with its abundant features. Keep reading to find out why it's one of our top picks in the segment. Smooth ride even when the road isn't; can accommodate up to eight passengers; plenty of cargo space behind the third row; peace of mind that comes with top safety scores. A decade ago, if you wanted a vehicle with eight seats and a giant cargo bay, your choices were either a minivan or an SUV big enough to require its own ZIP code. Today, though, there are several large crossover SUVs that give you generous interior space in a reasonably sized package, and the 2016 Chevrolet Traverse remains one of our favorites. Although a fully redesigned model is right around the corner, the 2016 Traverse continues to be a competitive choice in this class. The Traverse could be viewed as the blue-collar member of GM's large crossover trio, which also includes the upscale Buick Enclave and the "Professional Grade" GMC Acadia. But the Chevrolet is quite nice in its own right and can be equipped with nearly the same set of upscale luxury features as its siblings. The Traverse offers a cavernous interior, and while drivers are unlikely to feel like they're at the wheel of a Mini -- the 40.4-foot turning circle makes for a rather unwieldy feel in tight parking lots -- it's certainly easier to wheel around town than bulky body-on-frame SUVs like Chevy's own Suburban. Additionally, the Traverse rides comfortably and boasts enviable crash test scores. If you're shopping in this segment, there are some fresher rivals to check out. Honda's Pilot is redesigned for 2016, with a new look and a roomier third-row seat. The face-lifted Ford Explorer isn't as roomy in back, but it offers upgraded engines that provide either improved fuel economy or more power. Other recommended options include the handsome and well-equipped Hyundai Santa Fe and the Toyota Highlander, which is one of the great all-rounders. Among these tough competitors, though, the 2016 Chevrolet Traverse holds its own with a nice blend of comfort, space and value. High-end versions of the 2016 Traverse don't come cheap, but you get luxury-grade appointments in return. Standard features on the entry-level Base LS (1SM) include 17-inch steel wheels, automatic headlights, roof rails, a rear spoiler, front and rear air-conditioning, 60/40-split folding second- and third-row seats, a tilt-and-telescoping steering wheel, cruise control, Bluetooth phone connectivity, the OnStar telematics system with 4G LTE connectivity, a rearview camera, a 6.5-inch touchscreen display and a six-speaker sound system with a CD player, an auxiliary audio jack, a USB audio interface and two additional USB charge-only ports. The Base LS model is only available with front-wheel drive. The 2LT includes all of the above plus an auto-dimming rearview mirror, a power liftgate, tri-zone automatic climate control, heated front seats, second-row captain's chairs (the second-row bench seat is still optional) and rear-seat audio controls and headphone jacks. You also get the MyLink infotainment interface, which includes Bluetooth audio connectivity, voice controls, Internet radio app integration and a 10-speaker Bose audio system. The top-of-the-line LTZ model comes with 20-inch alloy wheels, power-folding mirrors, a blind-spot monitoring system, a rear cross-traffic alert system, forward collision warning and lane-departure alert. Inside, the LTZ boasts leather upholstery, driver seat and side mirror memory function, an eight-way power front passenger seat, ventilated front seats, a heated steering wheel and a navigation system. The second-row captain's chairs are also mandatory. Some of the upper trim levels' standard features are available as options on lesser models. Also available, depending on trim level, are a panoramic sunroof, a 10-speaker Bose surround-sound audio system, a rear-seat entertainment system (includes a household-style electrical outlet) and a towing package. The 2016 Chevrolet Traverse features a 3.6-liter V6 engine that produces 281 horsepower and 266 pound-feet of torque in the LS and LT trim levels. The LTZ's dual exhaust outlets bump output up to 288 hp and 270 lb-ft. A six-speed automatic is the only available transmission, but buyers have a choice of standard front-wheel or optional all-wheel drive in all but the Base LS model (which is front-drive only). In Edmunds testing, an all-wheel-drive LTZ sprinted to 60 mph in 8.1 seconds, which is a bit slow for a large crossover. Properly equipped, the Traverse can tow up to 5,200 pounds. EPA fuel economy estimates are 19 mpg combined (17 city/24 highway) with front-wheel drive and 19 mpg combined (16/23) with all-wheel drive. These are average fuel economy numbers for a large, V6-powered crossover. Properly equipped, a Traverse can tow up to 5,200 pounds. Standard safety features on all 2016 Chevy Traverse models include antilock disc brakes, traction and stability control, a rearview camera, front-seat side airbags and full-length side curtain airbags. OnStar is also standard and includes automatic crash notification, on-demand roadside assistance, remote door unlocking, stolen vehicle assistance and turn-by-turn navigation. A unique center airbag between the front seats, which is designed to protect occupants from colliding with one another in the event of a side impact, is an option on the 1LS trim level and standard on LT and LTZ. Rear parking sensors are also standard on the LT and LTZ. A blind-spot and rear cross-traffic monitoring system is standard on the LTZ, as are forward-collision alert and lane-departure warning systems. The latter two are optional on 2LT models. In Edmunds brake testing, an all-wheel-drive LTZ required 119 feet to stop from 60 mph, a better-than-average result for a large three-row crossover SUV. In government crash tests, the Traverse earned a top five-star (out of five) rating for overall performance, with five stars for overall front-impact protection and five stars for overall side-impact protection. The Traverse also fared well in Insurance Institute for Highway Safety crash tests, in which it received the highest rating of "Good" in the moderate-overlap frontal-offset, side-impact and roof-strength tests. The Traverse's seat/head restraint design was also rated "Good" for whiplash protection in rear impacts. The 2016 Chevrolet Traverse features a roomy interior with handsome styling and respectable materials quality. The overall look and feel ranges from pleasant in the lower models to downright upscale in the top-of-the-line LTZ trim level. Front-row passengers will enjoy abundant head- and legroom, as will second-row occupants, but the middle-row seat cushions are a bit low. Sliding those seats all the way back alleviates this legroom issue, but effectively kills third-row legroom. Access to the back is a breeze thanks to big rear doors, though the second-row slide release is difficult to access. Once you're back there, the Traverse's third row isn't as comfortable as that of the 2016 Honda Pilot, for example. It's realistically best suited for small-stature adults or children, especially if you want to fit three across. The 2016 Traverse is quite simply the boss of this segment in terms of cargo capacity. As is invariably the case with three-row vehicles, rearward visibility is almost nonexistent when you have a full crew onboard, so the standard rearview camera is a huge help. The camera's image and infotainment system controls are displayed on a 6.5-inch touchscreen that's mounted a little too low on the dash to view with a quick glance and surrounded by touch-sensitive secondary buttons that may look vaguely interesting, but are less functional than normal buttons. The occasionally slow response of the MyLink system to your inputs is another drawback. When it comes to cargo space, the Traverse is definitely a leader in its class. Even with the third-row seats in place, it can carry more luggage than most rivals. Space remains abundant when lowering either the second or third rows, as the Traverse offers more cargo space than any crossover apart from its corporate siblings, the Buick Enclave and GMC Acadia. The 2016 Chevrolet Traverse displays exactly the kind of road manners you'd want in a large, three-row family crossover. The ride quality is comfortable, composed and quiet on the highway, providing an assuredness that drivers switching from bigger truck-based SUVs will appreciate. At the same time, the suspension delivers sure handling and surprisingly good maneuverability for such a large vehicle. That said, smaller rivals are more responsive on twisting roads or in tight urban spaces, and the Traverse's wide turning circle can make it rather cumbersome to maneuver. Around town, the 2016 Chevrolet Traverse is a little cumbersome to drive. The 3.6-liter V6 engine is fine for most day-to-day driving conditions, but feels a little anemic when maximum acceleration is called for, such as attempting to pass slower traffic on a two-lane road. The six-speed automatic transmission generally delivers smooth gearchanges, but can feel sluggish when you need a quick downshift in situations like getting up to speed on freeway on-ramps.